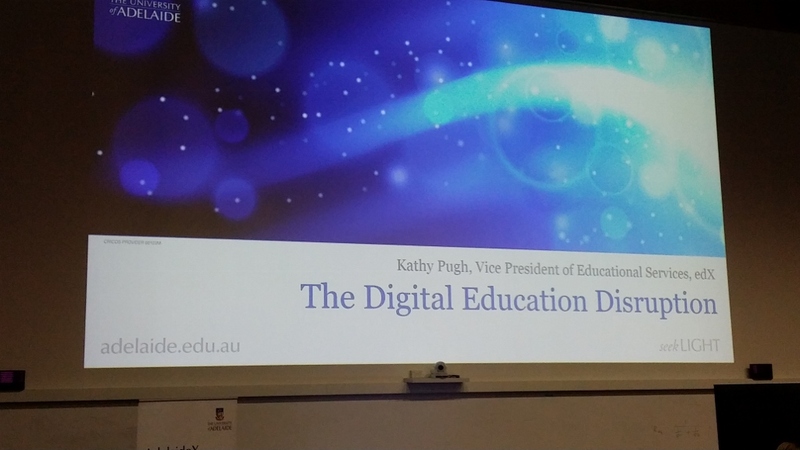 Kathy Pugh, vice-president of Educational Services at edX presented ‘The Digital Education Disruption’ seminar to almost 200 staff, students and academics at the University of Adelaide in March 2017. Kathy’s presentation offered an overview of edX, its global reach and impact. It explored the move to credentialling of MOOCs and how radical flexibility in the MOOC environment can offer students globally the chance to choose and manage their own study pathway. The seminar was also an opportunity to launch edX’s MicroMasters, which is anticipated will accelerate the expansion of the global learner community and present new opportunities for partners to develop innovative ways to ensure integrity and quality of MOOCs. The video of the seminar and presentation slides can be viewed on the related links. This entry was posted in AdelaideX, AdelaideX Events, Massive open online courses and tagged credentials, edx, MicroMasters, MOOC, Online learning, Open learning. Bookmark the permalink.